I very early got on the Morrowind bandwagon. No, scratch that. I didn't climb aboard, I was one of the extremely early reviewers who helped in some small way to drive it. The immersive quality of the 3D visuals along with the seemingly endless series of quests to do and places ripe for investigation made this title one of my favorites in many years, despite the holes that allowed exploits, and the poor economics. Now along comes Oblivion and I find myself neither helping to move that bandwagon, nor mindlessly jumping onboard. There's a good deal to enjoy in Bethsoft's latest game, but I can't help feeling that they've actually fixed many things that didn't need repair, while leaving longstanding problems from Morrowind alone. Let's start with the visuals. Once again, the Elder Scrolls developers have chosen a great-looking engine for their efforts. The artwork for the styles of architecture they've created are distinctive, with none of the narrow tunnel style that beset Morrowind forcing you on occasion to climb over guild members to reach a door or the next room. Similarly, magic effects are beautiful, and the dungeons are more varied in content, with realworld physics applied to numerous traps (spiked pits, trip wires holding numerous heavy logs, etc). It's true that most of the numerous merchants never seem to visit any other area in their large, well-stocked shops, and after a few dungeons you'll easily see duplicative cells; but these are relatively minor points in a truly splendid job. Let's not forget to factor in animation, too. Overall the impression is one of moving within a real world. That's quite an achievement. At the same time, it comes with a cost. 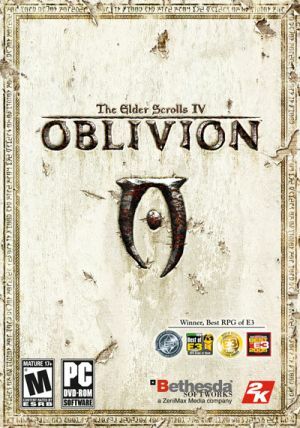 The computer that could easily run Morrowind and even add on 200+ mods, is often jerky and unresponsive touring Oblivion's Cyrodil. This even holds true for Xbox users. I've tried the game on both platforms, and although it was marginally superior in performance on the Xbox, there were far fewer options available to correct problems, since the PC allowed direct access to the game's INI file. That said, neither was especially fast, and in both cases the crawl in loading all those beautiful views distracted me substantially from their enjoyment. This is even allowing for the fact that Bethsoft clearly compromised by providing very few NPCs on their streets, giving the impression of deserted cities. There are also problems with those same game physics that are otherwise so enjoyable. If you move close to a table without touching it, the over-sized, invisible edges of the object meshes are bumped, and everything sitting on it is, too. This can send all the carefully arranged books, food, and other items on top flying. Bad enough as that is, even worse is the near impossibility to manipulate objects in that environment. In Morrowind, you could drop books and armor pieces and make a stack. In Oblivion, dropping any item precisely at a given location is an exercise in futility, as it goes flying away from you. Was it really impossible using the Havok system to build in a command allowing players to position and drop items? Of Oblivion's combat system, I can only say that the (new moves) you gain when skills reach certain levels leave me unimpressed. I'm not the kind of player who thinks that using a special attack on something nasty directly in front of me should involve shuffling to one side or the other, or taking a step backwards. This is too close to Doing the Timewarp. Assigning a special key would have made more sense, since it would have left you free to move in any direction or combination of directions at the same time. On the other hand, I do like the way monsters now attack and retreat, or block, or run to acquire distance for a magical attack. They also seem quicker to use beneficial spells on themselves than in Morrowind, though I've as yet not seen any enemies buff one another up for the attack, as in Wizardry 8. Speaking of magic, it's been toned down. This is one of those areas where Bethsoft chose to correct an aspect of Morrowind, where players found plenty of exploits (Drain Health on a weapon, bypassing native resistances; Levitate for hours and shoot arrows at enemies on the ground; etc). Some spells simply aren't enchantable on weapons or armor any longer, while others have been severely limited. Nor can all spells be cast by anybody with enough magicka. Now, most require a certain level of competence in the relevant magic school skill; so a very powerful fireball spell with a long range and area of effect might require a Destruction level of 75. The overall balance is much better, in my opinion. Kudos to Bethsoft on this. I like the new inventory display system, too, with its flexible sorts. The thing's complexity takes a bit of getting used to, but it works well, except in displaying the tiny, non-resizable map. Inventory labels are easy to read and, by the nature of the beast, very well organized and scrollable. Quest details are also far easier to find and study than in previous ES releases, though once again there's no ability to add journal entries. The new zoom-in faces during discussion are a nice touch, though the small number of voices used repeatedly for the 1000+ NPCs quickly becomes wearing. The changeover of voices is sometimes annoying, too, as when an elderly, senile mendicant switches to a posh young voice when you ask her about rumors; a friendly NPC suddenly scowls and insults you when giving out quests. It doesn't make sense. On the other hand, Bethsoft has finally gotten around to using a faded gray on discussion topics that only repeat what has been said: about time. NPC writing is more distinctive overall, though the old ES flaw of no real character interaction continues to exist. There are no dialog trees, much less the kind of cleverly designed branching of Baldur's Gate II that made it seem like you could really choose to split the game through a major choice at least, for one chapter. You either accept a quest in Oblivion, or you don't. Nearly everything else is just a matter of listening silently, and that's hardly roleplaying, is it?